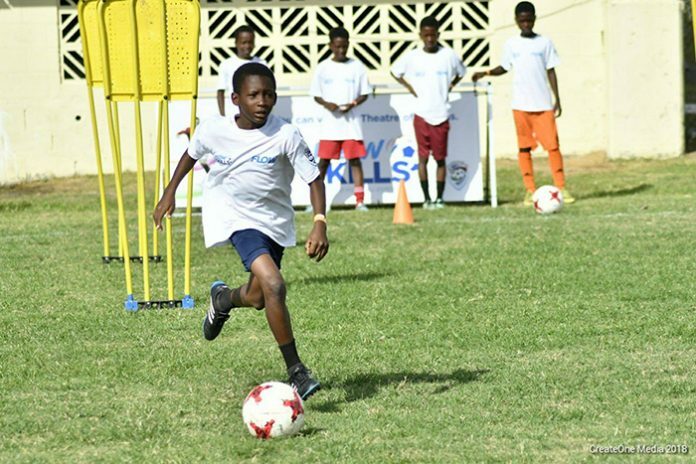 Telecommunications giants FLOW and one of the world’s most popular football clubs Manchester United have partnered to provide a life changing opportunity for young footballers in St. Kitts and Nevis with the second hosting of the FLOW Skills Ultimate Football Experience. The event that was hosted at Warner Park was geared at challenging young footballers in multiple areas including short passing, dribbling, defensive qualities, teamwork, and attitude. Marketing Representative for FLOW Sharisma Patrick explained that FLOW and Manchester United had partnered to give young footballers an opportunity to participate in a chance of a lifetime skills development initiative that the Caribbean Football Union (CFU) has endorsed. Patrick further explained, that up and coming footballers between the ages of 12 and 16 were nominated by their football clubs to compete in the competition that was open to males and females. The FLOW official added that the challenges were part of the Manchester United Soccer Schools programme, with local coaches evaluating and ranking each player..
Patrick noted that this initiative forms part of their support for sports across the entire Caribbean region and provide youth with positive monumental changes. She said, “FLOW has invested heavily in the development of football across the region. And our partnership with Manchester United reaffirms that commitment. The FLOW ultimate experience gives us the opportunity to develop Caribbean youth and provide them with positive life-changing experiences. “Along with Manchester United we want to give our young athletes hope to see the potential within themselves. Like Manchester United we have a deep sense of commitment as such can be seen by our support of several programmes throughout the region that help to hone the skills of young footballers,” Patrick noted. At the end of the day however Raheem Ponde was adjudged the winner in the 12-13 age group while Leon Huggins won the 14-16 group. Both of them will progress to the finals in Trinidad and Tobago later this year.